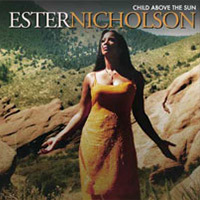 Ester Nicholson: "Child Above The Sun"
Ester Nicholson has seen it all and lived through some of the most unimaginable things even a twisted mind could conjure up. Having found God and a bright new outlook on life she felt it best to share her message and spirituality with everyone. She is an Agape-licensed, spiritual therapist, author, and performer. Ester is an extraordinary artist who has performed with the likes of Rod Stewart and Bette Midler. She has been hailed as "a demonstration that no person is beyond redemption and that life-changing renewal is possible for everyone - regardless of personal history or current circumstance." Her new album entitled Child Above The Sun is as Gospel as it is contemporary jazz or R&B. The album traces her extraordinary journey from soulless addiction to love and self-realization. A truly inspiring and emotionally charged performance by Ester that can captivate even the most grand pessimist.